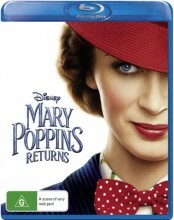 The Mary Poppins Returns Blu Ray is set in Depression-era London where a now grown Jane and Michael Banks, along with Michael's three children, are visited by the enigmatic Mary Poppins following a personal loss. Through her unique magical skills, and with the aid of her friend Jack, she helps the family rediscover the joy and wonder missing in their lives. The Mary Poppins Returns Blu Ray stars Emily Blunt, Colin Firth and Meryl Streep. Click the button below to add the Mary Poppins Returns (Blu Ray) to your wish list.